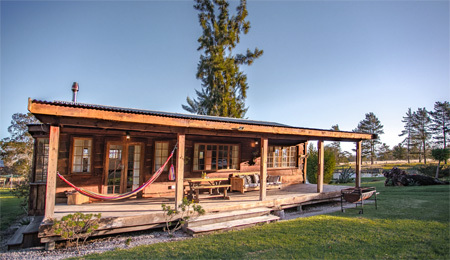 Bella Manga offers comfortable, clean, well-equipped accommodation in a unique country setting. All our rooms offer en-suite bathrooms, heaters & fans, a fridge and coffee & tea facilities. On-site entertainment includes two swimming pools, a guest lounge with Satellite TV, free WiFi as well as a games room with a pool table and darts. 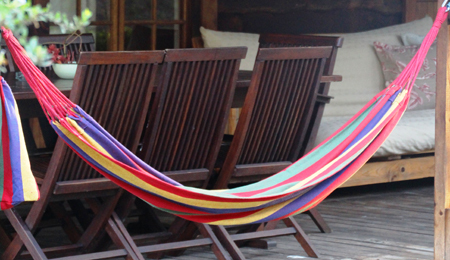 Enjoy the popular communal African fire pit area for outdoor cooking and the star-studded sky. 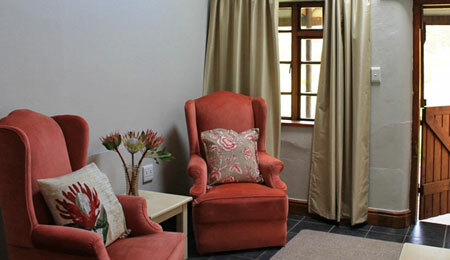 B&B rooms are serviced daily and selfcatering units every 3 days; extra servicing can be arranged. Luxury Bed and Breakfast rondawels and rooms, beautifully appointed and equipped with a small fridge, coffee/tea station and hairdryers. Comfy beds, crisp white linen, fluffy towels and block-out curtains assure a peaceful rest. 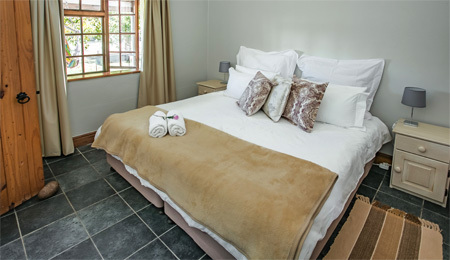 Our B&B rooms are all en-suite with king or twin beds. They open onto the garden by the big salt water pool and Old Dairy lounge. 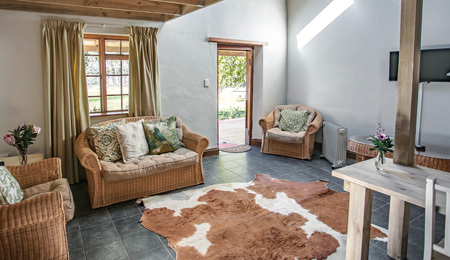 Included in your B&B rate is a cooked farm style or continental breakfast as well as fruit, yoghurt, home made muesli, fresh breads and muffins and home-made jams. Evening meals can be provided by prior arrangement. We have a selection of home cooked meals that can be ordered by 2pm, prior to arrival. Contact us for the daily menu. 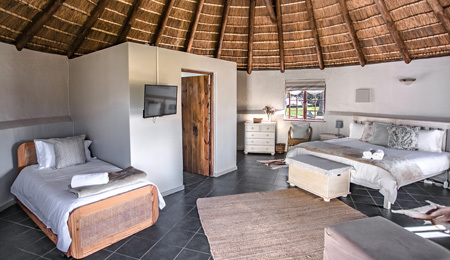 Choose between a one or two-bedroom self-catering suite or a spacious fully equipped 2- or 3-bedroomed lodge. 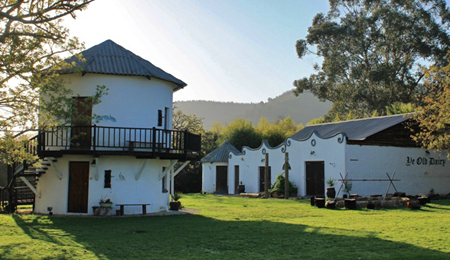 The lodges are set apart from the main guesthouse area with their own access road and secure parking. 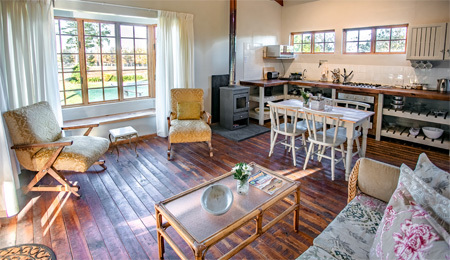 The three lodges offer fully equipped kitchens, a large veranda & braai facilities. The lodge area has its own swimming pool with a lapa. 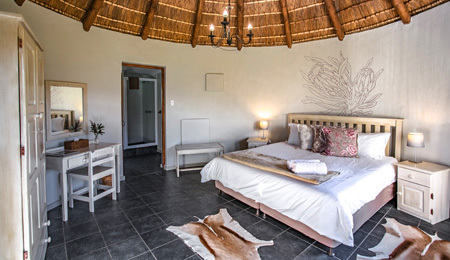 The 3 lodges together make for a perfect bush getaway for a group, or a family holiday. 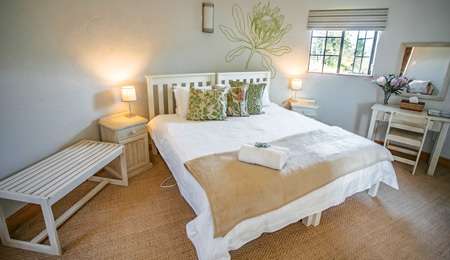 Self-catering guests can pre-book breakfast @ R80 per adult and R50 per child under 12. 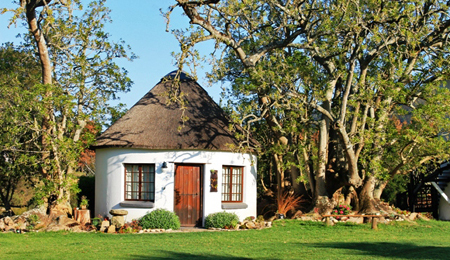 The Weaver rondawel and Kingfisher rondawel rooms are built in a traditional African round hut style with a thatched roof. Each offer an en-suite bathroom with shower and opens up onto the main garden area. Index B&B top S/C top BOOK IT! Upper and Lower silo rooms are set in an old converted grain silo. These king or twin rooms are up- and downstairs from each other (they can be booked separately as each has its own entrance). Each offers an en-suite bathroom with a shower. They open up onto the main garden; with a beautiful view across the valley. The Upper silo has one of the best sunset views on the farm. The family rondawel is a round, converted water reservoir with a thatched roof. This large room is ideal for families, with king or twin beds, and 2 extra single beds. It can sleep 3 adults and a child, or 2 adults and 2 children. An extra foldout mattress can be accommodated for a young child. The en-suite bathroom has a bath. 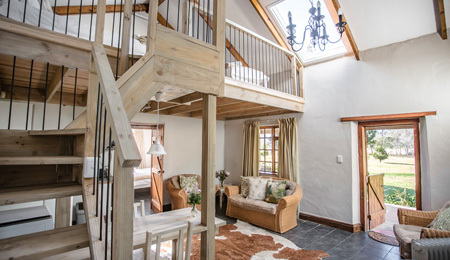 These two rooms are set in converted farm buildings. They are light and airy with each en-suite bathroom having a bath and shower. Both rooms are close to the pool and games room. 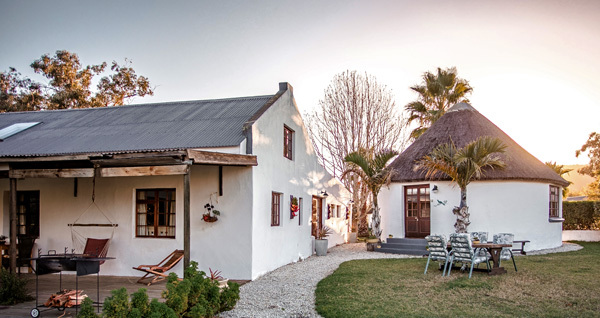 These self catering suites are set in a converted farm building next to each other. They open up onto a large veranda and garden beyond. 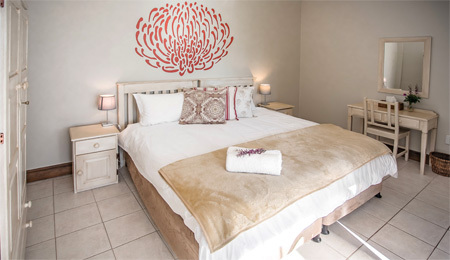 These units each have an en-suite bedroom with King or Twin beds and a lounge area equipped with a kitchenette. Braai facilities are available. 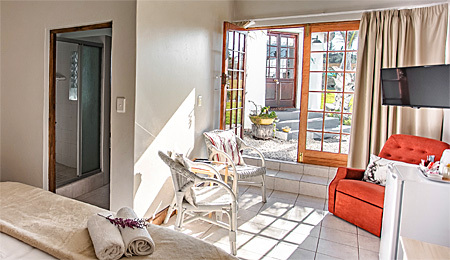 Both rooms provide for an amazing view of the African sunrise. Peacock suite can accommodate 2 adults in king or twin beds. 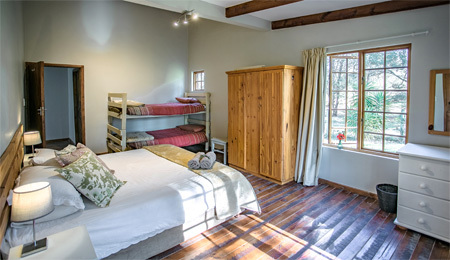 Macaw suite can accommodate 2 adults in king or twin beds, plus 2 adults or 2 kids on 2 single beds in a loft room. This suite has a skylight in both lounge and bedroom to view our beautiful big sky! 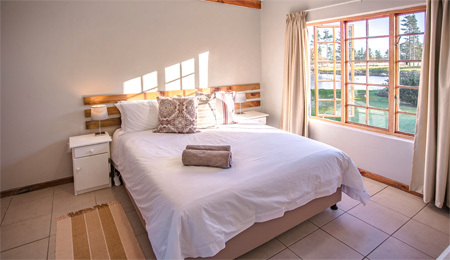 This beautiful wooden cabin has two bedrooms and two bathrooms (main en-suite). One bedroom has a queen bed and the other twin beds. It sleeps 4 adults, or 2 adults and 2 kids. The lounge has a cosy closed combustion fire place for cooler nights. 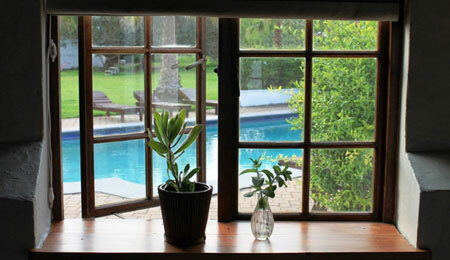 This unit is closest to the pool with its own large veranda, braai facilities and beautiful tree views. 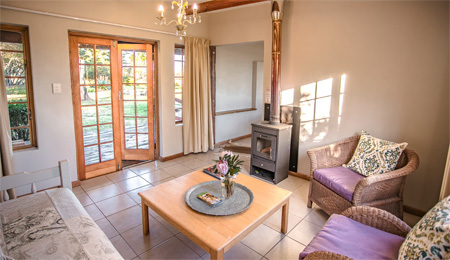 This lodge is a converted farm cottage; brick structure with two bedrooms opening onto the veranda. One bedroom has a queen bed and the other twin beds. It sleeps 4 adults, or 2 adults and 2 kids. Ideal for families or close friends. Bedrooms are en-suite – one with a shower and the other a bath/shower. The well-equipped kitchen with dining area has a large window overlooking the dam and trees beyond, with amazing sunset views. The lounge area has a cosy closed combustion fireplace for cooler nights. The large front veranda looks out onto the garden & majestic trees. Own braai facilities are available. 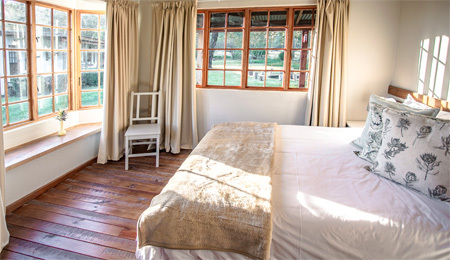 This beautiful wooden lodge had 3 bedrooms with king, queen or twin beds, all with veranda access. The main bedroom with king or twin beds also has 2 bunk beds. This lodge can sleep 6 adults and 2 children, or 4 adults and 4 children. Two rooms have en-suite showers and the third a full bathroom. 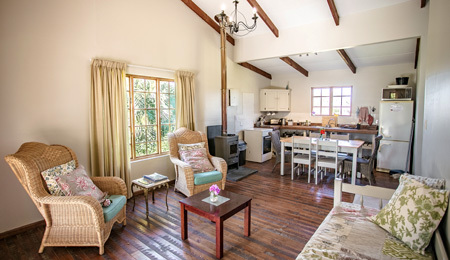 The large veranda has its own private braai facilities where an old chimney from a farm cottage many years back sets the scene for a fire-side chat. 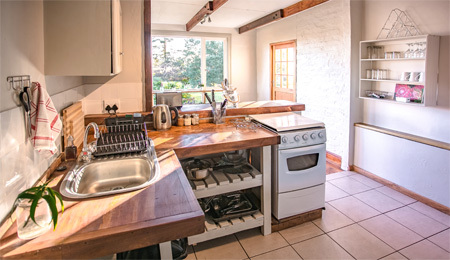 This large wooden house offers a large open-plan kitchen area, plus a closed combustion fireplace in the lounge to keep you cosy in winter. 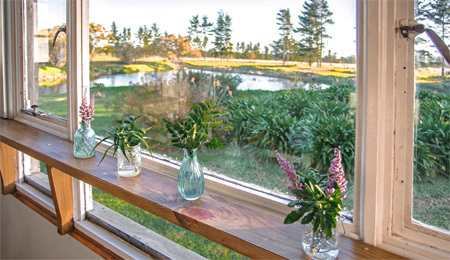 Nguni lodge is nestled at the end of the property, with soothing lake & forest views and allows for quick access for walks around the gum or pine trees. 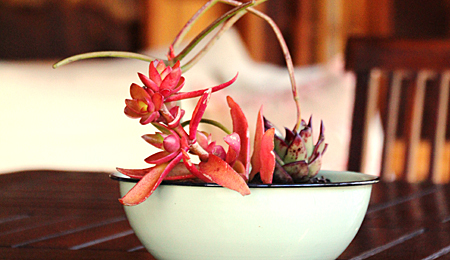 "The location is wonderful, especially for families. The garden is large, there is a playground and 2 pools (a bit fresh ;-)) and lots of animals. With children very nice times to "turn off". The fire pit was great and also the service - they cleaned every morning. Wood was free and was always refilled. Also in the self-catering cottages every 2nd day room service was done (including washing dishes)." 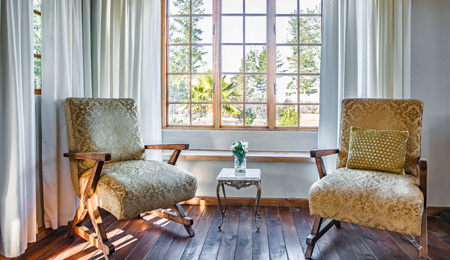 "We stayed in both the Self Catering and the B&B, and would like to recommend both to anyone wanting a great time in the countryside of Plettenberg Bay. And we would have no hesitation in returning. All in all a great time." "My husband, small child and I stayed at Bella Manga and it was absolutely incredible. BEAUTIFUL location in what felt like the middle of nowhere, and yet only 15 minutes drive to wherever we needed to be. We let them know we had a baby and .. a high chair was waiting in our lodge when we arrived. Lovely family running the place with an exceptional breakfast. BBQs set up at each lodge were such a nice treat. We absolutely plan to be back!" We fill up very fast for holiday periods and long weekends - book in advance!